Chile's government agreed to extend its peacekeeping force in Haiti for at least one more year, but it sent out a message that is commitment should start to wind down. President Michelle Bachelet said 2014 and 2015 should be viewed as a period of "preparation for the substantial and programmed withdrawal" of military personnel in Haiti. Already, Chile trimmed its Haiti troops to 426 from 479 the prior year. Its desire for a smaller footprint in Haiti isn't new. In 2011, Chile announced a measured withdrawal. 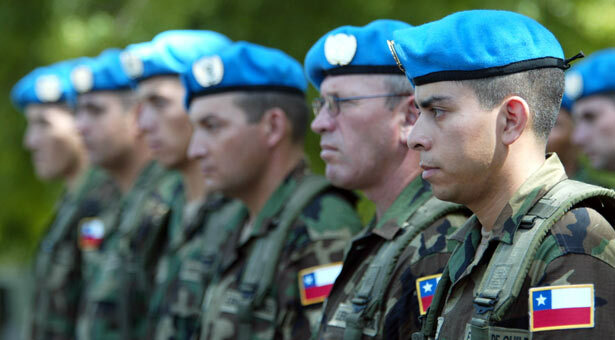 Chile is one of 20 countries providing military personnel to the UN MINUSTAH stabilizing force, which has a total strength of nearly 8,000 soldiers and police. Chile, which has served in MINUSTAH since 2004, spends $26 million a year in personnel costs plus $15 million for operating costs for the mission. Last year, the UN reimbursed $16 million, according to El Mercurio. Haiti has been Chile's largest peacekeeping commitment, and Chilean commanders consider it an important way to gain the type of training that would not be possible in their regiments. Chile's 10-year mission has consisted mainly of support services, such as policing, escorts and medical assistance. The Air Force (FACh) operates a squadron of four UH-1H helicopters for assorted transportation needs. Chilean casualties have been minimal and none from combat. In 2013, the UN made a 20% cut in MINUSTAH forces. But as the mission evolves into nation-building, the UN has no timetable for a complete withdrawal. Still, MINUSTAH's leaders also have expressed a desire to exit the impoverished Caribbean nation. In an interview with El Mercurio, the Navy's new commander said he is satisfied with the size and capabilites of Chile's fleet, but he has four acquisition programs in his sights. 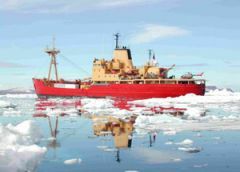 Chile's only icebreaker, the 45-year-old Almirante Viel, is due to be retired soon, and a replacement has become a priority as Chile reinforces its sovereignty in the Antartic region. Adm. Enrique Larrañaga also said the Navy plans to replace its Skymaster light maritime patrol planes with seven new aircraft. Two more Super Puma helicopters are planned, as well as replacements for the oldest light helicopters in the fleet. The Navy has three remaining Bo-105 helicopters, a model that is being replaced with the Eurocopter Dauphin. The admiral said those procurement projects will span the next four years, which basically covers his term as head of the Navy. Interestingly, he did not mention another multi-role ship as a priority, even as he praised the current multi-role ship, the LSDH Sargento Aldea, for its relief work after the April 1 earthquake in the north of Chile. Reports have linked Chile to the possible sale by France of the Siroco, the sister ship of the Sargento Aldea. For the second time in five months, an Air Force F-16 has crash landed. The latest accident occurred when a landing gear failure forced an emergency landing at the air base in Antofagasta. In October, another F-16 crash-landed when a tire blew on takeoff. And in March 2012, an F-16 had another landing-gear problem, resulting in a belly landing. All three mishaps involved the F-16 MLU (Mid-Life Upgrade) version, bought second-hand from the Netherlands, and all occurred at the same air base. Landing gear problems have been known to trouble the F-16 fleet, especially the older planes such as the MLUs. But the damage from a belly landing is fixable, and there's been no losses yet among the 46 F-16s that FACh operates. But it is a problem that has affected just the MLUs, at least in recent memory. And whenever an air force shares a runway with a civilian airport, as is the case with all Chilean air force bases, problems spill over to airline operations. This month's accident caused a four-hour runway closure that delayed a few flights. Leave it to Chile to warm up to Russia at a time when the West is cooling on Moscow. In the middle of the Ukraine crisis, Russian Foreign Minister Serguei Lavrov visited Chile, where his Chilean counterpart said the two countries plan to strengthen military ties. There's never been much of a military alliance between the two countries. Chile buys most of its weapons from western countries and has integrated itself well with NATO forces. Meanwhile, Russia's efforts to sell arms to Chile keep getting frustrated. In 2009, Chile's Air Force agreed to acquire five Mi-17 transport helicopters from Rosoboronexport, what would have been the first Chilean purchase of Russian equipment. But U.S. officials pressured Chile to back away from the $80 million purchase and to go with the U.S.-made (and much more expensive) Sikorsky Black Hawk instead. Eventually, Chile yielded and Peru ended up buying the five helicopters, though it never went forward with the Black Hawks. The crash of an Mi-17 during a demonstration flight at the 2002 Fidae air show didn't help Russia's marketing, either. But now, Chile is listening to Russia again. At this year's Fidae, talks restarted on a helicopter deal. The Army seems settled on Eurocopter's Cougar, but FACh is looking to add airlift capabilities. Despite the 2002 crash, FACh was satisfied with the Mi-17, which now looms as Russia's best chance to break into the Chilean market. While the Army's armaments manufacturer and Israel Military Industries are the main developers of Chile's new multiple launch rocket system, a third company is playing a key role in the program. Desarrollos de Automatizacion (DESA) is providing the fire control system for the SLM Famae. Unlike the other major defense companies in Chile, DESA is a private firm, and it's been involved in a number of electronic upgrades for the Army and Navy for more than 20 years. DESA started out in 1993, when it won a contract for a fire-control system for the Navy's SAAR-3 missile boats. Since then, it has built integrated combat, command and control, artillery fire direction and other systems. It also upgraded the Goalkeeper Close-In Weapon System used in some of Chile's frigates. Web searches turn up little about the company, yet its resume makes DESA perhaps the most advanced military contractor in Chile. Now, it has a stake in the country's top weapons program. The SLM Famae is a truck-mounted launcher that can accommodate any type of artillery rocket. Using rockets developed by IMI, the SLM Famae can hit targets 10 km to 150 km away within a 10-meter circle of error. DESA's fire-control system was practically tailor-made for the SLM Famae, a company executive told Defense News, but it can be used on any artillery rocket or self-propelled howitzer system.